Vapor or plastic? Sage Ranch dirt was handled carefully before truckin'. The chips sure got cashed in before the all the truckin’ from Rocketdyne through the San Fernando Valley was fully tallied. Turns out that Boeing, without environmental permits, will excavate, remove and transport off nearly two and half times more truckloads of contaminated dirt than earlier calculated. There is an estimated one million cubic yards of contaminated soil on the site, which suffered the worst meltdown in American history in 1959. 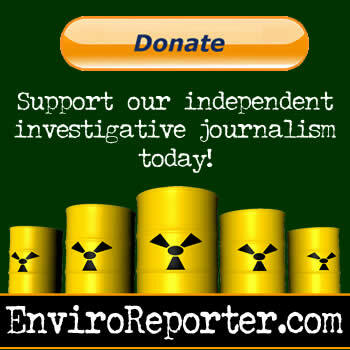 Over 74,000 truckloads of toxic cargo could rumble through the San Fernando Valley over the lifetime of the cleanup, scheduled for completion in 2017. But something just didn’t seem to add up. 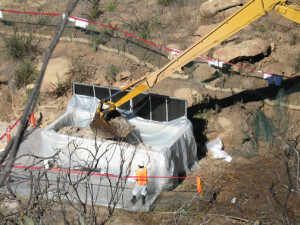 Boeing says that “over a 100” truckloads of toxic turf from Outfalls 008 and 009 at the Santa Susana Field Laboratory have to be dug up and hauled off site before the rains come. And it needs to do this without discretionary permits from the county of Ventura that would have made sure stringent environmental guidelines are followed when excavating and transporting the gooey dirt, contaminated with chromium, dioxins, mercury, lead and who knows what else, off the former rocket testing and experimental nuclear testing facility. But then, consider the source. The polluters made that estimation. And it turns out that Boeing’s numbers were all wrong. And not just the numbers. Detailing what this just-approved cleanup won’t have in the way of environmental protections somehow went AWOL too. A closer examination reveals a significantly different idea of the amount of gooey dirt that will be trucked through the San Fernando Valley. The fact sheet says that 8,500 cubic yards of material would be removed taking 764 truckloads to do it. Using those numbers to recalculate just how many truckloads “over a 100” it will take to truck off the nasty goo from Outfalls 008 and 009, the answer is an estimated 2,700 cubic yards of dirt that will take 243 truckloads! 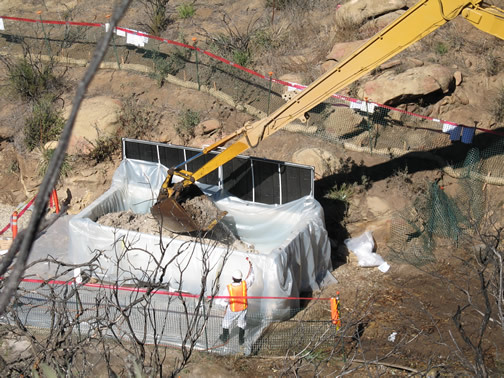 According to Norm Riley, DTSC’s project director for the lab cleanup, potentially upwards of one to two million cubic yards may have to be remediated on the huge and polluted Rocketdyne site, much of it trucked off. Utilizing these new DTSC numbers, one million cubic yards would take 89,847 truckloads. Two million cubic yards would require 179,694 truckloads. With excavation scheduled for about five years, that would translate to 17,969 truckloads of dirty dirt per year for one million cubic yards, or over 49 trucks per day, seven days a week. Now why Boeing would mischaracterize the number of trucks that will be heading down into the San Fernando Valley with no assurance of the environmental protections that DTSC used at Sage Ranch? And why would Boeing not volunteer to have mandatory environmental protections during this massive operation? Boeing is required to do none of this. In fact, it isn’t required to even notify the County of Los Angeles that it will be hauling 243 truckloads of toxic dirt through the west San Fernando Valley to who knows where. What a long strange trip that’s going to be.